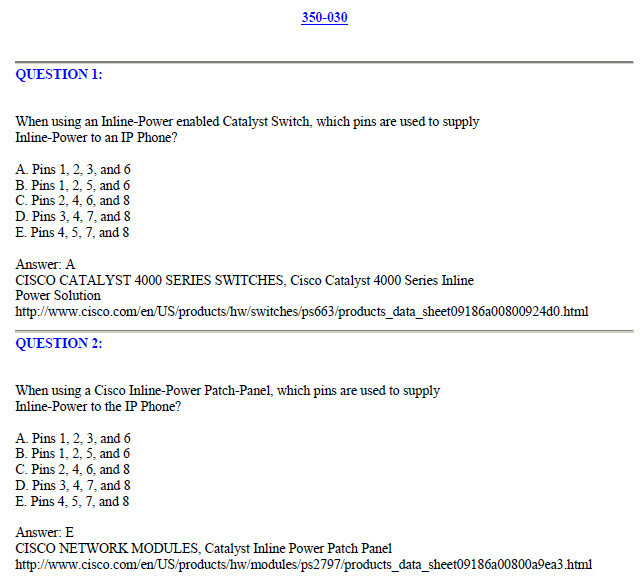 This is the Exam 350-027 with subject CCIE Written: Metro Ethernet. Download this exam sample to help your CCNA exam. The answer for each question already provided. You can download the file at the end of this post. With regard to jitter, which of the following statements are true? A. Jitter is the variation from the time that a packet is expected to be received and when it is actually received. Voice devices have to compensate for jitter by setting up a playout buffer to accept voice in a smooth fashion and avoid discontinuity in the voice stream. B. Jitter is the actual delay from the time that a packet is expected to be transmitted and when it actually is transmitted. Voice devices have to compensate for jitter by setting up a playin buffer to play back voice in a smooth fashion and avoid discontinuity in the voice stream. C. Jitter is the actual delay from the time that a packet is expected to be transmitted and when it actually is transmitted. Voice devices have to compensate for jitter by setting up a playout buffer to play back voice in a smooth fashion and avoid discontinuity in the voice stream. D. Jitter is the variation from the time that a packet is expected to be received and when it is actually received. Voice devices have to compensate for jitter by setting up a playin buffer to accept voice in a smooth fashion and avoid discontinuity in the voice stream. You are a network administrator at Certkiller . Your newly appointed Certkiller trainee wants to know what the term “MGCP backhaul” means. A. Transporting T1 CAS messaging to the MGCP Call Agent across IP. B. Transporting ISDN Q.931 messaging to the MGCP Call Agent across IP. C. Transporting ISDN Q.921 messaging to the MGCP Call Agent across IP. D. Transporting ISDN Q.931 messaging into MGCP events to the MGCP Call Agent. E. Encapsulating ISDN Q.931 CDR records to a RADIUS server. Your newly appointed Certkiller trainee wants to know what type of signaling can provide automatic Number Identifications (ANI) on a T1/E1 line. What will your reply be? Select two. Really good post, but that doesn’t seem to be compatible with my router ip, any hints?